Outdoor games and activities, simple recipes, a new song, workshops, crafts and many more surprises that will light up the faces of the children in your group. Word flashcards, coloring pages, activity sheets, stationery, crafts, puppets, games, plus many other firefly-themed documents. 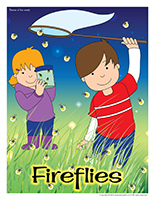 (Open thematic poster-Fireflies) Print, laminate, and display all kinds of posters. 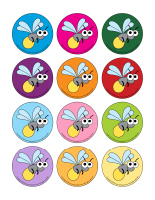 (Open educa-decorate-Fireflies) Print, cut out, and laminate. Use the items to decorate the walls of your daycare and set the mood for the theme. (Open models-Fireflies) Print. Let children decorate the garland. Cut it out and hang it within your daycare or near your daycare entrance. 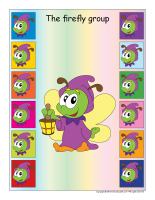 (Open educa-theme-Fireflies) Print and laminate the items that represent the theme. 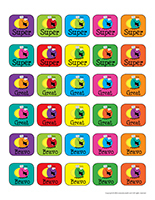 Use them to present the theme to your group (and parents) while decorating your daycare. 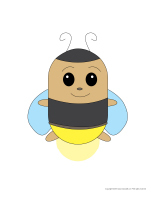 (Open stickers-Fireflies) Print the illustrations on adhesive paper. Cut out the items and use the stickers to reward children. Create a fascinating centrepiece simply by depositing a string of white Christmas lights in a clear container to represent a jar full of fireflies. This special tool was created in response to a special request received. (Open group identification-Fireflies) Print and use the various documents to identify children's belongings and decorate your daycare. 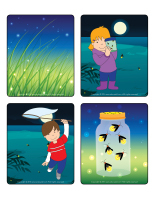 (Open picture game-Fireflies) Print and laminate the pictures in the format you prefer. Use them to spark a conversation with your group and ask children questions related to your theme. Hold a fly swatter in your hands. Sit in a circle with your group and use the fly swatter to point to a child and invite him/her to name an item that produces light like a firefly. If a child cannot think of an answer, transform him/her into the insect of your choice. The child will, of course, momentarily have to act out the corresponding insect. For example, you may ask a child to hop like a grasshopper, fly like a butterfly, walk like an ant, or crawl like a caterpillar. (Open picture game-Fireflies) Use the pictures to decorate your daycare or to spark a conversation with your group. Print, laminate, and store the pictures in a Ziploc bag or in your thematic bin. 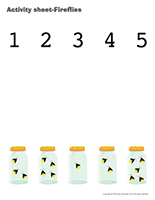 (Open picture game-Fireflies) Print the pictures twice and use them for a traditional memory game. 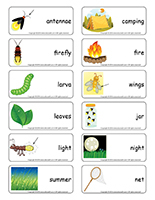 (Open activity sheets-Fireflies) Print and follow instructions. 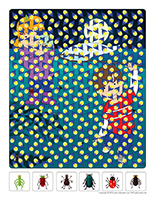 (Open educa-spots-Fireflies) Print for each child. Use bingo markers to color inside the spots. If you don't have bingo markers, you may simply invite children to deposit dry cereal (Cheerios) or stickers inside the spots. 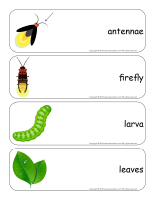 (Open writing activities-F like firefly) Print for each child or laminate for use with a dry-erase marker. (Open stationery-Fireflies) Print. 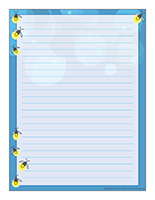 Use the stationery to communicate with parents, in your writing corner, or to identify your thematic bins. (Open educa-nuudles-Fireflies) Print for each child. Have children color the sheet. Once they are done, they may use Magic Nuudles to turn the coloring pages into three- dimensional works of art. Variation: If you do not have Magic Nuudles, ask children to fill the spaces designed for Magic Nuudles with bingo markers or stickers. To order Magic Nuudles. Green straw (from Easter baskets) in a shallow bin with plastic insects. Make only green, brown, black and red building blocks available in your area. Children can use them to create giant insects. Assembly games (K-Nex or Magnetix) children can use to imagine scary or silly insects. Drinking straws that can be connected to create the longest worm ever seen! You can even have a contest among friends or with another group. Plastic insects and paint. Children can make prints, make the insects walk over paper, etc. Attach plastic worms (or jelly worms) to a fishing rod and dip them in paint to make impressions on paper. Make insect crowns! Use a strip of paper and antennae (use red and black for a ladybug crown or yellow and black for a bumblebee crown). A roll of toilet paper, cardboard wings, pipe cleaners for antennae, and a small quantity of paint can easily become a bee or a butterfly. A coffee filter with a clothespin attached in the middle can become a butterfly or a dragonfly. Add a few drops of food coloring for a special touch. A butterfly model and several colors of tissue paper. Children can tear and crumple the tissue paper and glue it on the wings to make a multicolored butterfly. A butterfly (or ladybug) traced onto a transparent acetate, colorful sand, and glue to create a stained-glass window effect. Display in a window. Two paper plates (a plate cut in two), a fastener, red and black paint...and you get a magnificent ladybug! Two egg carton cavities, wiggly eyes, a small amount of black and yellow paint, cardboard or tulle wings, and antennae...a wonderful bumblebee! Bits of yarn (brown, pink, black) to make a worm collage. Glow in the dark paint can be used to make fireflies. Use two empty toilet paper rolls, string, and cellophane paper to make binoculars. With string and paint, paint like worms! 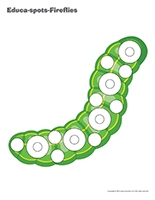 Use a series of egg carton cavities to make a caterpillar. Black or brown paint can be blown on paper using drinking straws to make spiders. Stencils with insect, flower, and garden-related shapes. Set up a beekeeper area. Add a hat with a protective net, a rain suit, a few bees (or other insects), a large square box which may be used to represent a beehive, a few instruments such as a watering can, shovel, etc. 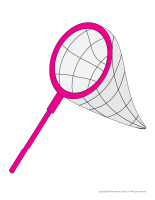 Organize an insect hunter area with butterfly nets, containers for insects, plastic insects of all kinds, insect posters which may be used to identify insects, magnifying glasses which may be used to observe insects, etc. Don't forget to have a picnic...there are always insects at picnics! You can also organize a gardening area with various gardening tools (toys), a few watering cans, empty pots for plants, etc. You may add gloves for gardening, a hat, part of a hose, knee protectors for gardening, etc. Memory game using educatall pictures. Puzzles made with insect pictures or other puzzles you have on hand which tie into the theme. Modeling dough and insects which can be pushed into it. Cookie cutters shaped like flowers can be fun too...insects love flowers! Salt dough can be used to create insects...let dry. Real insects you have captured in small transparent containers. Several illustrations of insects. Find the ones with the same number of spots! Association games with bees and flowers of the same color! Colourful firefly pictures may be used to decorate the walls. Insects with dotted lines for tracing. 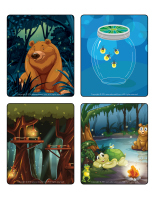 Games in which children must find the errors involving fireflies. Games with educatall word flashcards. We are fireflies flying in the dark. Obstacle course with chairs children must crawl under like ants in an anthill. Simon says...to act like fireflies. Deposit a jumping rope on the floor and have children fly over it as if they were fireflies. Wave a jumping rope and invite children to jump over it without touching it. I am flying like a firefly. Pin the tail on the insect! Hang a giant bumblebee on the wall and have children attempt to place its sting in the correct place while blindfolded (like the pin the tail on the donkey game). Children place themselves on their hands and feet, placing their feet on the shoulders of the child behind them...what a caterpillar! Children sit in a circle with a ball of yarn. Make a giant spider web by throwing the ball to one another. Fill a bin with dirt and add real worms! Sandbox...hide plastic worms or other insects in the sand. Bin filled with Honeycomb cereal. Water table, a few lily pads (Styrofoam), and a few insects which go on the water such as a praying mantis or dragonfly. Make your own vivarium using an old aquarium. You may also give each child a small transparent container. Add dirt, a few strands of grass, and insects children find while playing outdoors. Cover with a screen. 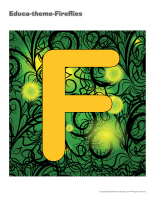 (Open word flashcards-Fireflies) Print and laminate the word flashcards. Have each child pick a flashcard. They can take turns presenting the word they picked to the group. With your group, talk about each item. Ask children questions to encourage them to share what they know about each one. (Open educa-chatterbox-Insects) Print and laminate the pictures. Cut them out and deposit them in a shoebox or opaque bag. Decorate the box or bag to represent your theme. Add tiny objects, photos, and accessories related to the theme to the box or bag. During circle time or when children are, for example, waiting for their meal or snack to be served, ask children to pick an item and name it. (Open story and memory game-Insects) Print, cut out, and laminate the pictures. Place them face down on a table or on the floor. Children take turns picking three cards and inventing a story in relation to the illustrations. Trick: To solidify the game, glue each card on the top of a frozen juice can. (Open transition games-Fireflies) Print two copies. Laminate and cut out the cards. Glue one copy of each card on the table using adhesive paper. Drop the other copies in a bag. Children take turns picking a card to determine their spot at the table for the day. You may also use the cards to determine naptime spots or for your task train. (Open transition games-Fireflies) Print, laminate, and arrange the pictures on the floor, creating a path within your daycare. The path may lead to various areas frequently visited by children throughout the day such as the bathroom, the cloakroom, etc. If you prefer, use the pictures to delimit your different workshops. Fill a container with games and toys related to the theme to keep children busy once they have washed their hands. The only rule: their hands must be clean if they wish to manipulate the contents of the bin. Hunt and seek...at the table! Visit our theme archives and print several hunt and seek games related to the current theme. Set them on the table where children eat and secure them in place with adhesive paper. Hand children the small cards so they can search for the items as they wait for their meal to be served. Inflate several balloons in which you have previously inserted a battery-operated tea light. Turn off the lights off and let children have fun tossing the balloons up in the air. Fun variation: Insert a glowstick in each balloon for a colourful twist. Turn off the lights and close all blinds and curtains within your daycare. Encourage children to complete an obstacle course you have created for them, collecting glowsticks hung here and there as they move along. At the end of the course, children can connect all the glowsticks to form a colourful circle of light. Use glowsticks designed to be worn as bracelets for this activity. Hide several tiny insects within your daycare. Give each child a flashlight. Turn the lights off. 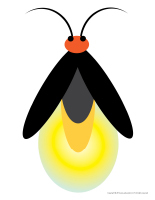 Children can turn their flashlight on and pretend they are fireflies searching for insects. Every time a child finds an insect, invite them to say, "I found an insect!" before handing it to you. 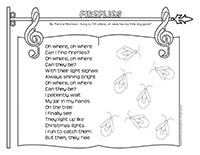 (Open string activities-Fireflies) Print for each child. Children trace the lines with white glue and then position a colourful string on the contour of each shape. (Open educa-symmetry-Fireflies) Print. Children must color the picture on the bottom to make it look exactly like the picture on the top. (Open educ-intruder-Fireflies) Print and laminate. Children must circle the six intruders in the picture. (Open luminescent firefly) Print and cut out the various firefly parts. Insert a glowstick in a plastic Easter egg before gluing the parts on the egg. You will have a pretty luminescent firefly that can accompany children during naptime. Give each child a flashlight. Turn the lights off and close any blinds or curtains to make your daycare as dark as possible. Let children walk around the daycare, using their flashlight to explore different items. Hang tiny Christmas lights under a table and drape a dark blanket on top of it to create a little hideout. Each day, pick a child who will be your "firefly of the day". Let him/her spend as much time in the firefly house as he/she wishes. You may choose to let the child invite a friend to join him/her to read or eat their snack. The child may even choose to sleep in the firefly house at naptime. Make sure each child is given the chance to be the "firefly of the day" during the theme. You can also add a small box filled with luminous objects inside your firefly house. Children will love manipulating the contents of this special box. Turn the lights on and off in a rhythmic fashion. If your group is very active, this can represent a great way to calmly invite them to gather around you. Have fun using this light signal often during the day to provide your group with the opportunity to practice gathering quickly and efficiently. Take advantage of this activity to discuss electricity and lighting with your group too. Add a glow-in-the-dark sticker to the tip of a Popsicle stick. Turn the lights off and invite children to wave the "fireflies" around as you sing the song suggested at the end of the theme. Add a glow-in-the-dark sticker to the tip of a Popsicle stick. Turn the lights off and invite children to wave the "fireflies" around to observe the phenomenon. Do fireflies shine brighter in hot water? Deposit a glowstick in two different bowls. Pour lukewarm water in the first bowl and cold water in the second bowl. With your group, observe the glowsticks to determine whether fireflies shine brighter in hot or cold water. You will need two Ritz crackers, cream cheese, raisins, and a colourful piece of fruit (orange, kiwi, pineapple) for each child. Spread cream cheese on one cracker and deposit the piece of fruit on top, in the centre. Break the second cracker in half and position the pieces on either side of the fruit to represent wings. Add two cream cheese dots on which you can press raisins that will become the firefly's eyes. (Open models-Fireflies) Print. Let children decorate the fireflies. Cut them out and hang them within your daycare or close to your daycare entrance. (Open puppets-Fireflies) Print the puppet models on heavy cardboard. Have children cut them out and decorate them with a variety of arts & crafts materials. Stick a Popsicle stick behind each one to complete your puppets. Purchase several colors of glow-in-the-dark paint and let children use them to create a masterpiece, pretending they are fireflies depositing their light on paper. Create fireflies by pinching colourful pieces of construction paper accordion-style and gluing a clothespin behind them. Thread a pipe cleaner through the hole in each clothespin to represent antennae. Attach a glow-in-the-dark ribbon to the tip of each clothespin. Turn the lights off and admire your fireflies. (Open firefly jar) Print a jar for each child. Have children press their thumb in glow-in-the-dark paint (or yellow paint) and make prints inside their jar. Help them use fine black markers to draw wings and antennae to complete your jar full of fireflies. Show children how to thread several beads on a pipe cleaner, making sure to add a few beads that glow in the dark (sold in big-box stores). Help them position the beads at one end of the pipe cleaner and twist a second pipe cleaner around the first one to represent wings. Add two tiny wiggly eyes to complete their adorable glow-in-the-dark fireflies. You will need an empty water bottle for each child. Have them glue pieces of tissue paper all over their bottle. Once the glue is dry, insert one or two glowsticks inside each bottle. Seal the caps with hot glue. Encourage children to draw a firefly face on their bottle. Provide black pipe cleaners that can by used to represent antennae. Hang the firefly bottles from the ceiling within your daycare. (Open I am learning to draw-A firefly) Print and laminate the model sheet. Invite children to practice their drawing technique on the model sheet before trying to draw a firefly independently. 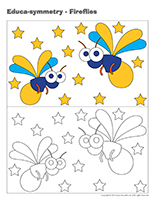 (Open coloring pages theme-Fireflies) Print for each child. By: Patricia Morrison	Sung to: Oh where, oh were has my little dog gone?